We were just a few days away from knee replacement surgery for Sam, with the second knee being replaced in the coming month. We felt the call of the road knowing it will be several months before we can take our truck camper or jeep out again. Neither of us had ever been to Bisbee or Tombstone, Arizona. Sam had a good excuse, only living here for 5 years. I have lived in Arizona for most of my 49 years, so it was past time to explore the Southeastern corner of Arizona. We took the long way around Phoenix, and took SR 86 through the Sonoran Desert. What should have taken 3 1/2 hours from Phoenix to Bisbee took us close to 6. We do not like to meet schedules as rose smelling is our forte and we appreciate having the freedom to stop and check things out. 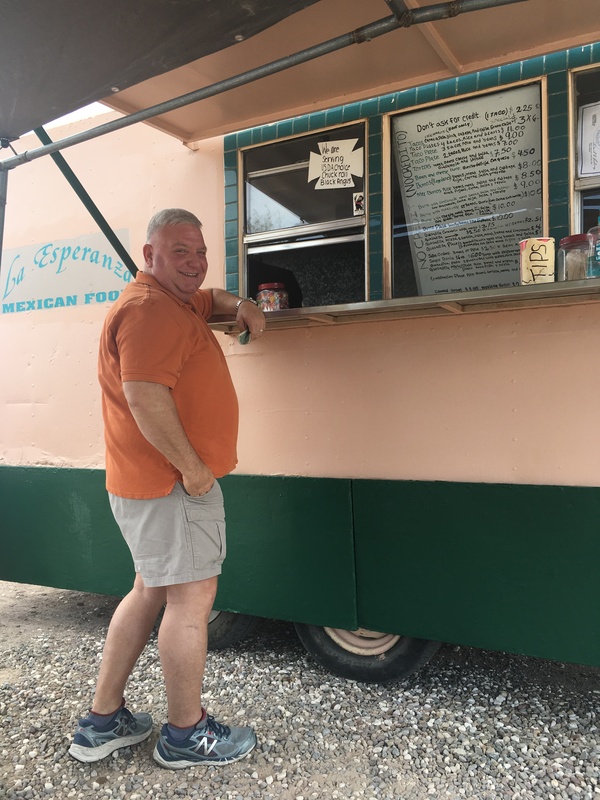 We stopped for lunch at a rustic little food truck on the East side of Tucson. What it might have lacked in atmosphere it definitely made up for in food quality and owner pride. 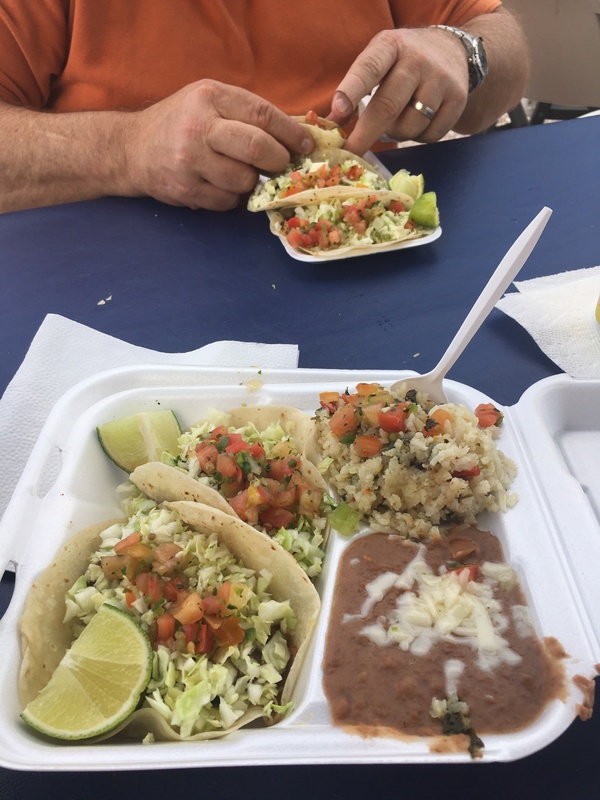 In our humble opinion, these were some of the best tacos we have ever had, and we are seasoned taco eaters. The owner was very proud of his food and talked with Sam about how long he had been in this spot (22 years), where he sourced his meat from and how he prepares his dishes. Sam loves to talk with people about food. Restaurant owners are so passionate about their food, you just have to ask them questions. It is such hard work and long hours, it is a labor of love. We drove into the mountains and went through the Bisbee Tunnel. We have very few tunnels in Arizona, so it is always fun to go through them. Sam’s family had a tradition of rolling down the windows and honking the horn when they went through a tunnel so the tradition lives on. He honked the whole way ignoring the odd looks his antics drew from the others fortunate enough to witness the tradition. The town is old, (by Arizona standards), founded in 1880 for copper, silver and gold mining. The town was very busy with people and cars this particular weekend. What we did not realize is this was the weekend for the annual Sidepony Music Festival. 100 bands in town playing at various venues in the down town area. We had reservations at the Inn at Castle Rock. This hotel is quirky and fun. Inside the hotel office you will find the Apache Spring. The hotel is literally built over it. We felt like we were staying in someone’s home. The rooms are all decorated in themes, and we stayed in the “last chance” room with an Asian theme. Many buildings in Bisbee are said to be haunted, and this hotel is no exception. There is a book at the front desk where guests can record their experiences. I truly did not want to have an “experience” with anything not of this world. Sam does not believe in ghosts. Let me digress for one moment to tell you about the time we stayed at the Hotel Coronado in San Diego. During the night the bathroom light turned on by itself four times. I would wake Sam up and say “Sam, the bathroom light just went on”. He would tell me “OK, get up and turn it off”. Under no circumstance was I going to get up and go in that bathroom. Sam got up and turned it off. This happened three more times that night, each time Sam got up and turned it off. The light in the bathroom was motion detected, so he said it was just malfunctioning. Really? He is still a non-believer. Back to Bisbee – we went first to the Stock Exchange Saloon and Grill. Many years ago this was the spot of the first E F Hutton opened up West of the Mississippi. This was opened by the grandfather of a very dear friend of ours. They actually had a ticker tape from the New York Stock Exchange and did trading on site. The walls still have chalk boards that they used to note the stock prices. We enjoyed a drink and a very loud band playing for the festival. What a lifetime this building has seen. Great to see the space has kept to its roots while staying viable today. It was a popular place. Next stop was St Elmo’s Bar – the oldest continuously operating bar in Arizona. It has history and personality, and good service. Our final destination was the Cafe Roka for dinner. This is on the list of top 100 restaurants in Arizona. The food and service were fantastic, and we really enjoyed the dinner. It was fine dining without being pretentious. We will return to try more things on the menu. Our night in the “last chance” room 21 was a bit long. I am a very light sleeper and the old building makes a lot of noises. I kept thinking the dresser drawers were opening. OK, I admit it, I can completely freak myself out. As the sun started to rise, we both got up and found our spots on the porch with coffee to enjoy the sun rise. The hotel has a kitchen that is available to the guests, so we helped ourselves to coffee and creamer. We felt comfortable and welcome. For the record, the dresser drawers were all closed. We said goodbye to Bisbee and set off for Tombstone about 25 minutes away. Tombstone is very historic, and definitely plays to the tourists with gunfights in the streets. The highlight of Tombstone was walking into the Tombstone Art Gallery that showcases local artisans. It had everything from paintings to crocheted blankets. We bought two beautiful watercolors painted by Jan Huthoefer from Sierra Vista. They depict desert cactus and ocotillo. We love to find items for our home to keep our travels alive for us. I will always be reminded of our Bisbee and Tombstone weekend when I look at these watercolors on our walls. We did visit the famous Boot Hill cemetery and it was bit unnerving the amount of crosses and tombstones that said “shot” or “hanged”. It really brought to life the stories we see in the movies. we saw the grave of Marshall Fred White who was shot trying to disarm “Curly Bill” Brocius (depicted famously in the movie Tombstone). We also saw the graves of the McLaury brothers and Billy Clanton, proof again to us that the story of Tombstone was not just a Hollywood movie. These markers will forever show how dangerous it was to live in Tombstone and the West. It was a wonderful weekend with Sam being a good sport hobbling around Bisbee and Tombstone. We look forward to returning to the area with our truck camper. The area also has Kartchner Caverns State Park, Chiricahua National Monument, and the wineries in Wilcox. Next time we visit, Sam will have the knees of a 25 year old.